New Product Pricing! We have reduced our prices on smalti and stone to reflect a cheaper Euro. Most of our trasparenti colors have been priced at $11.98 per half pound. This new pricing reduces the price to $10.96 per half pound. This discount is applied automatically. If you have a coupon discount you can also use this during checkout for further savings. When you look at smalti, it almost looks like candy. When you look at trasparenti, it looks like a sparkling jewel. If you want to add some sparkle to your mosaic, take a look at our 47 different colors of trasparenti. Click here for our trasparenti color mixes. To purchase a sample board, click here. Questions about trasparenti? Click here. How big are the trasparenti pieces? How do I cut trasparenti to the size I need? Any special considerations for cutting square cut? How much trasparenti will I need? Can I get trasparenti in other sizes? How do I fasten trasparenti to my mosaic? Does trasparenti need to be grouted? Isn't the correct spelling "transparenti"? Di Mosaico carries 2 sizes of trasparenti: normal cut and square cut. The normal cut of trasparenti is about 3/4" long x 3/8" wide x 1/4" thick, similar to smalti. The square cut trasparenti is 3/4" long x 3/4" wide x 3/8" thick and is much more regular in size than normal cut trasparenti. Like smalti, trasparenti can be cut with nippers, hammer and hardie, or chopping machine. The hammer and hardie is the traditional method and will work with both sizes of trasparenti. Nippers work well with the normal cut, but tend to shatter the square cut. In a half-pound of normal cut trasparenti, there are 90-100 pieces, which will cover about 24 square inches. The rule of thumb is to allow about 3 pounds of normal cut trasparenti per square foot. A half-pound of square cut trasparenti contains 21-23 pieces, which will cover about 12 square inches, so about 6 pounds are needed per square foot. Yes, just about any size can be special ordered, from smaller than normal cut to entire pizzas. You can certainly use grout in conjunction with thinset mortar, but trasparenti presents the same challenge as smalti in cleaning off an uneven surface. 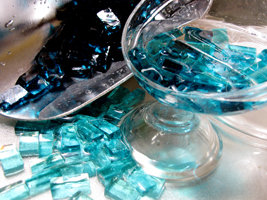 The process is very similar to smalti, but without the opacifying oxides, so the result is transparent. The correct spelling of the Italian word omits the first "n"